If you're like me, around this time of year you're on the hunt for a simple and unique ornament you can make and give to family at Christmas. I love the look of tying a handmade ornament to the top of a gift or having something unique and special to give as gifts for my children's teachers with a gift card. So, when Dremel asked if I'd like to make a tutorial for them using their Dremel Maker Kit I knew exactly what I was going to create. I love creating with wood (I make and sell relief carvings) and I've been aching to make something out of these wonderful wood slices that I bought online (Alternatively you can make them yourself). I've made a tutorial for a beautiful, simple ornament that won't take you hours to make yet still makes for a meaningful gift. When the maker kit arrived I loved how beautiful it looked (the Versatip comes in a really shiny metal case). I think this set will make a beautiful gift for the maker on your list who would like to try out wood burning, engraving and carving and it's good enough quality that professional makers will enjoy using it too. In addition to a Dremel Maker kit (or wood burner & engraver), you'll want to have on hand the following: Wood slices, paint, brush, string or ribbon, bull-dog clips (optional), drill bit (any brand of acrylic paint will do fine for this craft). You can make the same snowman as in the photos above, or draw any design you want on your wood slices (snowflake, a big snowman face, a reindeer, a pickle, whatever). I've made a free printable template - and since wood slices are going to vary a lot in size and shape, I'd recommend printing the sheet and scaling it until the size matches your wood slice. To transfer the image you can either use transfer paper, or copy the drawing as best you can. Make sure you leave enough room at the top of the ornament to drill a hole for the hanger. The first tool in the maker kit that you're going to fire up is the VersaTip. You can either use the soldering tip or cutting knife tip to make your outlines (I chose the cutting knife because the tip of it makes a finer line but you can use either). Work slowly, rotating the wood as you're going. *Safety - This tool gets very hot, so always keep an eye on where your hands are in relation to the tool tip and have a safe place to set it while it's cooling down. When you've finished outlining the snowman you can either leave him as he is, or you can make a simple wash with acrylic or watercolor (water it down pretty substantially so that the wood burnt look won't disappear and a subtle wood grain to show through). You can make a neat "frame" on your wood-slice by leaving the outer first ring unpainted. Once the paint had dried it's time to break out my favorite tool in the kit: The Dremel 200 (this the tool I typically use for my relief carvings). I used the engraver bit that was included, but if you go to your local hardware store you could purchase a tinier, more delicate bit to make more intricate snowflakes. Try to hold the tool at an angle and start by making a series of "x's" and rotating the wood-slice. Alternatively, you could also engrave small dots with this tip to make cute little dot-style snowflakes. *Safety - Always wear eye and ear protection on this step as well as the next one. Even if you didn't leave a nice white frame on your piece you can make one by using your tool to engrave the first ring of the wood-slice down a wee bit. I've never used the Dremel Engraver before today so after quite a few failed attempts, I figured it out. 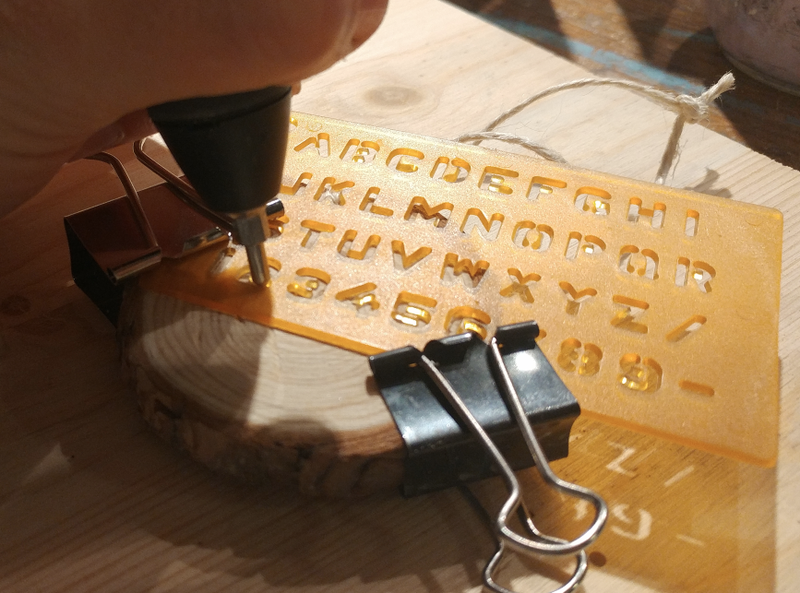 Using the template that comes with the engraver (letters and numbers on a little plastic sheet) attach it to the wood slice using bull-dog clips. If you attempt to hold onto it without securing it you'll make a big mess (here's where the failed attempts came in). Thank goodness the kit came with little drum sanders so if you make a mess like I did, you can just sand it smooth again in that spot. No harm done. After you secure your template, run the engraver over the number several times then move the template over, clip again and make the next number. Easy peasy. TIP: The engraver is very loud. I scared myself when I first turned it on, expecting it to be the same volume level as the rotary tool (it's not, times that by 5 at least). Ear protection will save you from the surprise I got. Using a drill-bit (you can get one for your dremel), drill a hole for the hanger. I cut rattan string for the hanger but a lovely ribbon or fishing line would also work great. TIP - save your work surface by drilling your wood slices on top of an old board. I would love to see your creation! Help me find your work by tagging me @crystaldriedger on instagram, twitter and facebook (@crystaldriedgerillustration). ***Full disclosure: I am being paid to make this tutorial (and was given a maker kit as well). Dremel's team told me right up front to give my honest opinion on their tools and gave me complete artistic and creative freedom as well. All opinions expressed in this tutorial are mine. Ready for something more challenging? If you have a maker kit you can make this too. Sign up with your email address to receive news, updates. stories and tutorials. We respect your privacy and won't clutter your inbox - expect news 1-2 times per month unless something exciting happens. .